Only seven days to go! In some ways I am so ready for it to be over. In other ways I don’t really mind and it’s easier than I expected it to be. There is so much to process through in what I’ve learned and what I’ll take away from this. I will for sure be keeping up a lot of these new habits. I love being so intentional about incorporating tons of veggies into each meal. I love being mindful of getting plenty of protein and fat in each meal. I’d say lunches and dinners haven’t been hard to make the switch, and I see many paleo style meals in our future, post-Whole30. I really love the practice of replacing the starch in your meal with more veggies. Breakfast is the one meal that I sometimes crave something different. A BUTTER, a piece of toast, soaked oatmeal once in awhile, the occasional paleo pancake WITH some real maple syrup, BUTTER…those are things that might sneak their way back in once in awhile :). I also miss my sweeteners. I’ve said before, I don’t use refined sugar, ever. But I do enjoy some healthified paleo-style treats now and again. And coconut sugar in my coffee. And honey in my tea. Ahhhh, yes, I have learned new and important habits. But I also am not afraid of some of the ones I had pre-Whole30. I will strive for a healthy balance going forward! 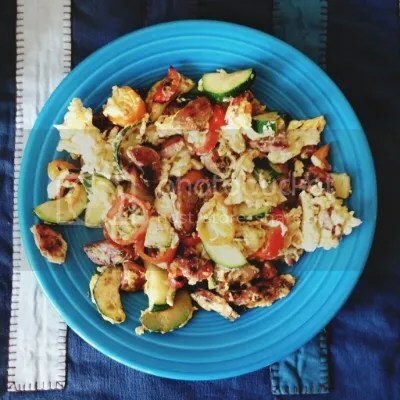 I’ve had this two days in a row: an egg scramble with chicken sausage, zucchini, and mushrooms, and those mini sweet peppers (my new obsession!). And then I decided to give this Sweet Beet Smoothie a try. Sounds gross, I know. It’s actually quite delicious! And the kids chugged it down. I was inspired to make it because I had a container of steamed beets in the fridge that needed using up. Then when I came across this recipe for the smoothie, I noticed that it called for cooked beets. 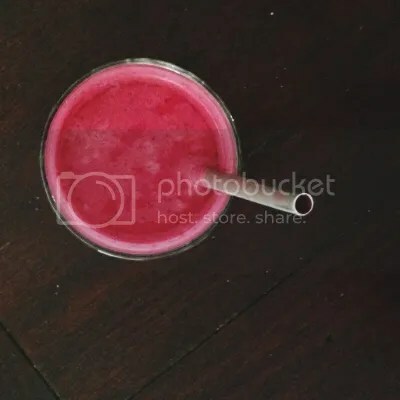 Now, I can’t say that I would ever go through the trouble of cooking beets just for this smoothie (they’re really a bit troublesome to cook, what with the peeling and inevitable pink-stained hands). But because I already some cooked and in the fridge, I decided to give it a go. And it was so good yesterday (and I had enough beets left over) that I made it again today! Also, it should be noted that I’m not really a huge smoothie fan. I like the idea of them. But then when it comes time to drink it I usually get about half way through and lose interest. Something about the texture? But this one I had no trouble at all getting down. *recipe notes: I omitted the protein powder and the honey. I added about 5 ice cubes just because I like my smoothies really cold and somewhat slushie. And I added a handful of frozen kale just to see if I could get away with it – didn’t taste it at all! My sweet mother in law took me and the kids out for a day downtown. We tried the Nordstrom Cafe for lunch. I was pleasantly surprised to immediately find something on the menu that needed very few changes to make it Whole30 compliant! I went with the Salad Nicoise with Herb and Garlic Salmon. It was so good! In case you’re not familiar (and since I forgot to take a photo), Salad Nicoise is a traditional French salad with hard boiled egg, green beans, capers, tomatoes, red onion, and potatoes. I believe it is traditionally topped with tuna, but I was happy to have mine with salmon. I of course omitted the potatoes, and used oil and vinegar for my dressing. Very very good and I’m excited to recreate it at home sometime. This dinner was a total Hail Mary that turned out as a win. We were getting ready to leave the house this morning when I decided at the last minute that I really wanted to try and come up with something to slow cook while we were gone, since I knew we would have a late afternoon and I would be crunched for time to make dinner. I literally ran out to the freezer in the garage and scanned the shelves. I found a hunk of round steak, ran it inside, cut the plastic off, and plopped it in my dutch oven. Then I poured a jar of Trader Joe’s Organic Tomatillo Salsa on top and added a little water. I put the lid on and threw it in the oven (250) and said a little prayer. When we got home five hours later, the house smelled heavenly. I pulled it out and things were looking hopeful! I cut up the meat into smaller chunks so that they could all nestle into the sauce a bit more. I had a head of cauliflower that I really needed to use up, so I decided to try making some “rice”, which I thought could be a good accompaniment for some saucy chunky meat (just take your food processor to your cauliflower until it’s in tiny pieces, and then boil those for 5-10 min and strain. Rice!). Sauteed a sliced zucchini, and we were good to go! At the last minute I decided to throw some diced avocado on top of the meat+rice. Heaven. Seriously, it was so good. Full disclaimer, though: Bret wasn’t really a fan. He wasn’t a hater, but he wasn’t excited about it. So, I’m not sure if I’m the weirdo or if he’s the weirdo. Try it at your own risk! 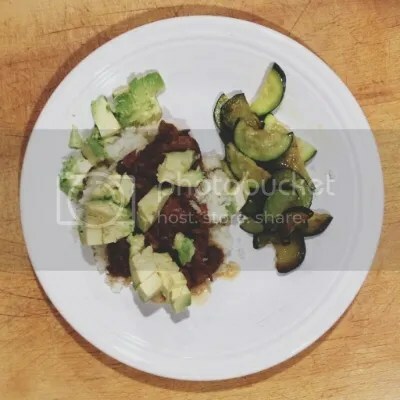 This entry was posted in Recipe, Whole30 and tagged avocado, beets, cauliflower rice, paleo, salsa, whole 30 on April 4, 2013 by bakerLove.